How To Find The high Quality 3.5 Ton Jack? There are so many tools that are used in the garage, but the floor jack is one of the most important ones. With a 3.5 ton floor jack, you will be able to accomplish a number of tasks, easily. The floor jack will elevate your vehicle to a comfortable height and this allows you to access all the components that are beneath the vehicle. The floor jack is quite instrumental when it comes to safety issues and can help you carry out routine checks on your vehicle. With tons of models on the market, it can be quite confusing to establish the specific type of floor jack that you should buy. You would not want to compromise on the quality and this guide will help you make an informed decision as to the most ideal 3.5 ton jack to buy. In addition to this, you will also learn how to use the floor jack in a safe manner so as to prevent any accidents or incidents. What’s The Top Quality 3.5 Ton Floor Jack in 2018? Just like other products, there are so many brands of the 3.5 ton jack and this can be quite confusing. Each model claims to be the best and ought to be considered. We have tested a number of models and have put together a number of floor jack reviews to help you get the best floor jack for the money. 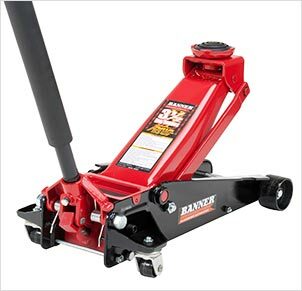 If you have a heavy vehicle, the Blackhawk floor jack is the best option for you as it can lift weights of up to 7,000 pounds. 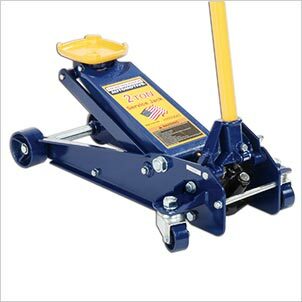 Most of the trucks and SUVs usually weigh 5,000 to 7,000 pounds, which can be accommodated by this floor jack. The lifting height capacity goes all the way up to 22 inches, which is quite impressive, considering that most floor jacks will have a maximum lift height of 18 to 20 inches. As for the minimum height, the saddle rests at 5 ½ inches, which means that you may not use it as a low profile floor jack. There is a rapid lifting mechanism on this 3.5 ton floor jack and this does not compromise the safety of the car that is being raised. With about 20 pumps, you should be able to get your load to the maximum height of 22 inches. When it comes to lowering the jack, you will use the release valve, which will lower it in about 4 seconds. Weighing 85 pounds, you can be sure of its strength and stability as it does not wobble when supporting the load. 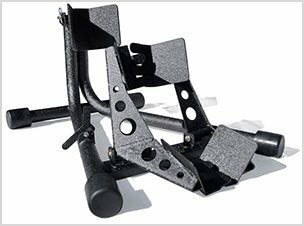 The rolled side frame are quite dynamic and will enhance the strength and rigidity of the Blackhawk floor jack for sale. The internal safety valve will boost the safety level as it protects the floor jack from any cases of overloading, while the bypass device will prevent any cases of over pumping. The saddle is well padded, which will cushion the frame of the vehicle and other components from any cases of marring and scratching. The one piece handle is 50 inches long, which means that you can use the floor jack while standing. The Blackhawk floor jack for sale has a lift capacity of 3.5 tons, which is well supported by the fast lifting technology . As for the safety issues, there is a built-in safety valve and a bypass device, which prevent overloading and over pumping issues, respectively. The saddle and rear casters swivel, which makes it easier to position this service jack. The heavy construction contributes immensely to the rigidity and strength of this floor jack. This is enhanced by the rolled side frames on this model. 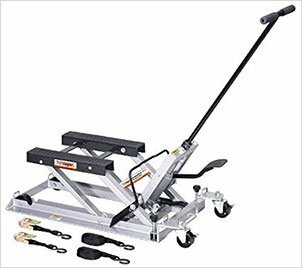 The Blackhawk floor jack has a lifting range of 5 ½ to 20 inches, which is quite remarkable and accommodates most vehicles. 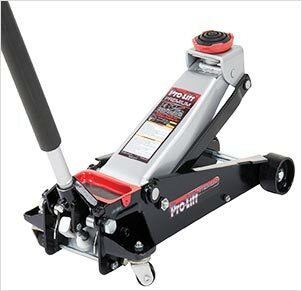 No one wants to spend so much time and energy jacking up a vehicle and as such, the Pro Lift floor jack would be a good choice as it only takes about 2 strokes to get the saddle to your desired height. This is quite convenient as it would not take so much of your time. This is the best jack for heavy vehicles as it has a lifting capacity of 3 ½ tons of load. The universal joint release features will provide ultimate precision control of the load that is being jacked up, irrespective of the position of the handle. As such, this means that you are able to lift the load pretty fast, without compromising on the stability as you will get perfect control of the load. This is a very stable 3.5 ton jack and will be very useful when you need to use it. 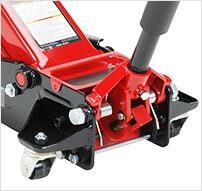 The rolled side frame on this floor jack will boost the rigidity and strength. As such, when you are using it, it will reduce any chances of twisting. 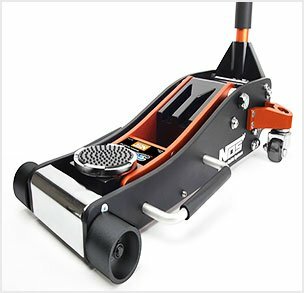 The wheels and rear swivel casters will also enhance the stability in addition to making it easy to position the floor jack in the desired position. The lift range of this floor jack is 5 ½ to 22 inches, which is quite remarkable. 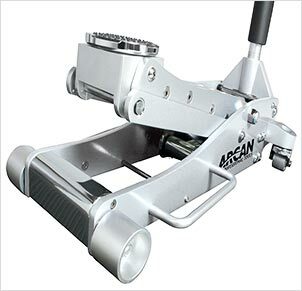 There are additional features which make this to be ranked as the best floor jack for the money. For instance, there is a magnetic tray on the floor jack, which allows you to place the parts that you are using such that they cannot get lost. The saddle is well padded with rubber, which will protect the vehicle that you are using the floor jack on. The Pro Lift floor jack is 3.5 ton floor jack, with a speedy lift technology, which allows you to jack your load in a very short period of time. For enhance and precise load control, this model comes with a universal joint release mechanism. The rear swivel casters and rolled side frame enhance the strength and stability of this floor jack. 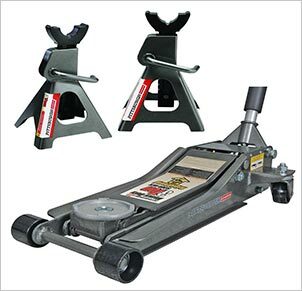 There is a magnetic tool tray, which offers exceptional convenience when using this floor jack. You can store small parts on the tray. The foam handle will give you a good and comfortable grip while pumping the floor jack. One of the most amazing features on the Omega floor jack is the Magic lift technology, which will give you a rapid lift. You will lift the saddle quite fast up to the point it makes contact with the load and after that, the lifting speed of the load is much faster than other models. As such, it takes you minimal strokes to get to the maximum jack point. With the minimum lift height being 4 inches, you can use this as a low profile jack as you can easily access the jack points on low profile vehicles. The maximum height is 21 5/8 inches, which would be sufficient to work on any type of vehicle. There is a breather plug, which is exclusively designed for this Omega service jack. This plug will remove the air that is in the hydraulic system conveniently. The floor jack has the capacity to lift vehicles with a maximum weight of 3.5 tons. The handle is quite sturdy and of a solid construction, which will give you the relevant force required to pump the floor jack. The heavy duty rolled frame on this jack will enhance the stability and there will be no cases of twisting, while the jack is in use. The wide frame will also optimize the stability of the floor jack when it is under the load. With the bypass device, the floor jack will be protected from any cases of over pumping, which is a safety mechanism for the hydraulic system. The universal joint release system will grant you precision control of your load. As such, you will not be worried when lifting your vehicle to the desired height. The Magic Lift is one of the most amazing technologies in the Omega floor jack. This will allow you to get to the jack point with one stroke and then takes very few strokes to lift the load to desired height. The universal joint release mechanism will give you the required precision on load control. The overall construction is solid and the rolled sides will enhance the stability of this floor jack, to a great extent. There is a bypass device, which seeks to protect the hydraulic system from over pumping. With this floor jack, you will be able to lift loads of up to 3.5 tons, without much difficulty. 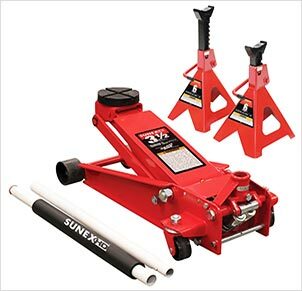 Sunex floor jack is the true representation of innovation when it comes to floor jacks. This is one of the best designed floor jacks for sale on the market. When it comes to heavy lifting this is the best floor jack as it has the capacity to lift loads of up to 3.5 tons. The ASME PALD compliance is an assurance of the quality of this floor jack and you will not be disappointed when using it. Besides the innovation. The performance and functionality of this floor jack are quite impressive as it is built to last. With this model, you are assured of great and exceptional service. All the features are integrated to ensure that they provide you with the support needed. This is a combination of all the exceptional features that you would want to imagine on a floor jack. The rapid rise technology will make it easy for you to get to the maximum height easily. This is made possible by the dual pistons that support the pump, making it possible to get to the maximum jacking point in 7.5 pumps, only. The maximum height attainable using this floor jack is 19.3 inches, which gives you enough clearance to carry out your repairs and routine checks. The handle comes in two pieces and this makes it easy to store and when in use, you will be able to get a handle that has a convenient length. 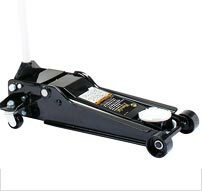 To enhance the support that this 3.5 ton floor jack gives, it comes with jack stands that are light to carry around, yet sturdy enough to support your vehicle. This is a great safety measure as it will ensure that the vehicle is steady when you need to work underneath it. The Sunex floor jack comes with double pistons, which support the rapid rising technology. As such, you can get to the maximum height with only 6 strokes. This model comes with stable jack stands, which can go as high as 24 inches. The heavy duty material used in the construction of the frame of the floor jack will keep it stable while in use. There is a high resistance to twisting when using it. The two piece handle will snap together easily and can be detached, without any difficulty. This will give you great convenience when storing this floor jack. The bypass and safety overload valves are safety features, which will prevent the overloading and over pumping of this floor jack. 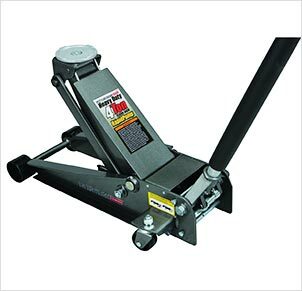 Getting a high performance Workshop or Garage jack can be quite strenuous if you do not know what you are looking for. There are many floor jack reviews that may act as a good guide when shopping for floor jacks, but also there are other factors which you should consider. Here are some of the key attributes to pay attention to in order to get the best floor jack. 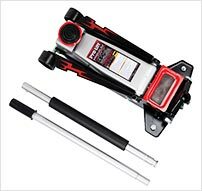 How fast does the floor jack rise to the jack points, and eventually to the maximum height? When shopping for a floor jack, you should be very keen on the number of strokes it would take for the floor jack to get to the desired height. Most modern floor jacks for sale have features that promote speedy lifting. If the floor jack is made from low quality material, then you can be sure that it will not last for a very long period of time. The type of material used, will also determine the strength and stability of the floor jack. Aluminum and steel floor jacks seem to be quite sturdy. When working on heavy trucks, you will need to have adequate access to the components underneath the vehicle. As such when shopping for a 3.5 ton jack, it would be important to establish how high it can go. Most models will go as high as 18 to 20 inches. Take a keen look at the capacity rating when comparing various floor jack models. This ought to be advised by the weight of the vehicle that you intend to use the floor jack on. You should get a floor jack that has the capacity to lift and support the weight of your vehicle. This makes the whole difference in the low profile and other types of floor jacks. You should be very careful so as to buy a floor jack that has an ideal height, when in the resting position so that you can have sufficient ground clearance. Floor jacks with a minimum height of 4 inches can be used as low profile jacks. How to Properly Use a 3.5 Ton Capacity Jack? 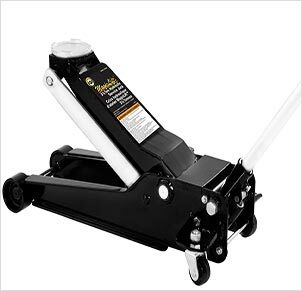 A 3.5 ton floor jack is able to support loads of up to 7,000 pounds, and as you can imagine, this is not light. When using a floor jack, one of the most crucial elements to pay attention to is your safety. Here is a simple guide, which will help you use the floor jack in the right manner. Never underestimate the essence of floor jack stands. Even when you have bought the best floor jack for the money, ensure that you have jack stands to support your load. You should never go underneath a vehicle without placing the jack stand to support the load. A floor jack is a mechanical device, which may fail without a warning, this is why you will need jack stands as supporting accessories. Before jacking up your car, please take a careful look at the terrain and assess if it is solid enough. You would not want a case of the floor jack sinking when you attempt to raise the vehicle. In addition, you should only jack up a car on leveled ground so as to prevent the vehicle from rolling. Establish the jack points before you can start raising the vehicle. Use the manufacturer’s manual if you are not sure where the jack points are. Using the floor jack on other points, besides the marked ones will result in serious damage and injuries. It is highly advisable to raise the car in slow motions. This gives you an opportunity to assess and monitor your floor jack so that you can trace any possible problems. If the floor jack is faulty, you should stop using it, right away. 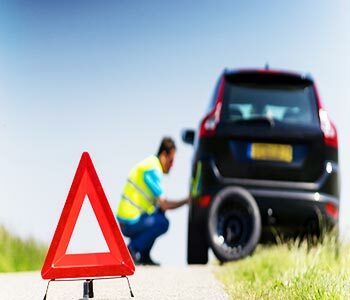 When lowering the vehicle, it is also ideal to lower it gradually so that you can detect any problems, as well. When you have managed to buy the best floor jack, the most important thing is to ensure that you are using it, in the right manner. You must have come across tons of floor jack reviews, with all manner of suggestion for the best floor jack for the money. Well, we hope that at the end of this guide, you would get the help that you needed and be able to buy the ideal 3.5 ton floor jack. From the models that we reviewed above, our recommendation would be the Pro-Lift G-737 Grey Speedy Lift Garage Jack – 3-1/2 Ton Capacity . Besides the ordinary features, it comes with a magnetic tray, which will hold your items intact when working in the garage. If you have found this article to be of great value, we would love to hear from you and also feel free to share this article with your friends and family.